Drunk-drivers disqualified from driving will have their names published on a list. TD John Halligan, Minister for Transport, Shane Ross and TD Finian McGrath. 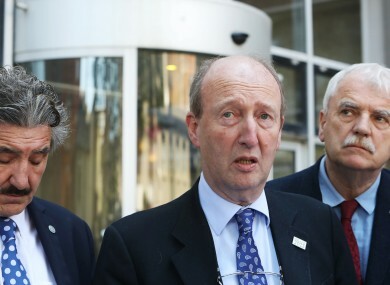 TRANSPORT Minister Shane Ross has said he plans to introduce a system for “naming and shaming” motorists who are disqualified for drink driving by the end of the year. Today the minister published his new drink-driving Bill that will see an automatic three-month suspension handed down to those caught with 51-80mg of alcohol per 100ml of blood. Currently those caught within that limit are given penalty points. Following a meeting today with the Road Safety Authority and road accident victim support groups, Ross called on groups representing publicans to “get off the pitch” and for Fianna Fáil to support his Bill. The minister said this new law was just the first phase of tackling dangerous driving, adding that a number of other measures to tackle mobile phone use while driving and speeding were also discussed at today’s meeting. “We will have name and shame legislation, certainly the heads of the Bill introduced by the end of the year, and hopefully will get the legislation into the Dáil very soon after that,” Ross told reporters today, adding that at the moment those featured on any future lists will be those disqualified from driving due to alcohol. While he said the naming and shaming of those caught for other offences had not yet been considered, he said he was not opposed to the idea. “We haven’t decided that yet as we haven’t got any new speeding laws in but if there is a need for it I see no reason why not… we could consider it, but at the moment it is not under consideration, it is specifically for drink driving,” he added. Ross said he first wants to get the new drink-driving Bill over the line before moving on to other measures. He acknowledged that Garda enforcement was also key in cracking down on dangerous driving. The minister said he has been given assurances that there will be more policing to clamp down on reckless drivers. Email “Shane Ross to 'name and shame' drink-drivers by the end of this year”. Feedback on “Shane Ross to 'name and shame' drink-drivers by the end of this year”.